1. 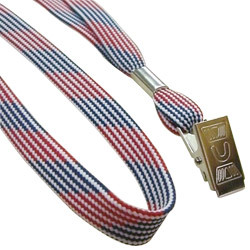 Webbing: standard tubular flat lanyards. 2. Woven-in patterns: frosted red, blue & white. 3. Vivid patterns without need for expensive imprint or woven (embroidery). 4. Simple woven-in patterns of your own design available with free assistance. (1) Metal finishing crimp (with optional engraved logo). (2) Metal swivel hook / bulldog clip / split key ring. 1. Size: 10mm (W) x 36” (L). 2. Colors: all pantone colors available with free PMS color match assistance. 3. For more details & product assistance, please contact us.